The famous Westclox alarm clock , has been made almost continually in the United States since 1909. So, I guess it's not very surprising that I made it part of my clock collection. Decades ago, and I won’t tell you how many except that if you were born in that year you’d be old enough to be President of the United States, I was wandering through an antique store when a bit of shiny polished nickel caught my eye on a shelf nestled among other “great stuff.” It was a delightful old clock that resembled a plump pocket watch with a name that has a double meaning, Big Ben. Of course, the original Big Ben is the famous tower clock in London and here was this little American upstart by Westclox with a patent date of 1919 on it. Needless to say, I determined that this decades-old timepiece did indeed still run and happily brought it home. I didn’t know then than I had purchased an early version of the quintessential American alarm clock that has been in production continuously from 1909 until the 21st century, except from 1942 to 1954 during World War II when Westclox contributed to the war effort. 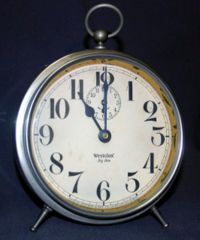 Westclox began life as the United Clock Company in 1885 in the renowned clock making center of Waterbury, Connecticut but became the Western Clock Manufacturing Company shortly thereafter. During the 1930’s the company merged with the famous Seth Thomas Clock Company and by 1936 the Westclox brand name was being manufactured by a Division of General Time Corporation. Unaware of all of this clock-making history, I had a Big Ben alarm clock in my possession. While I wound the mechanism and verified that the timepiece kept accurate time before leaving the antique store (they were stores then, not malls), I wasn’t aware of what the alarm sounded like. Little did I know that in 1908 the United Clock Manufacturing Company obtained a U.S. patent for the Big Ben alarm clock movement. The movement is called a "bell-back" design whereby the alarm bell mechanism is integral to the clock's case. You see, the metal case of the Big Ben is the alarm and the loud bell sound echoes from the whole clock. Prior to the Big Ben, an alarm clock was equipped with an actual bell and ringer mechanism on top or somewhere inside the case. On that fateful day I naively held the Big Ben in my hands and set the alarm to go off just a few minutes hence. Well, the operative phrase was “loud enough to wake the dead”; my old Big Ben worked very well indeed. American ingenuity had found a way to support the American work ethic of early to rise; there was no way to sleep through a Big Ben’s alarm! My trusty old Big Ben alarm clock made sure I went to work on time for many years to come. Today my old Big Ben is retired from official duty and sits proudly on the shelf with dozens of Big Ben’s of varying models along with their cousins, the smaller version of the alarm known as the Baby Ben. You see that one shiny old Westclox alarm clock kindled my love of old timepieces and interest in collecting clocks that has lasted for decades.